Infinite Music headed to the mountains this past August to be part of the 23rd Annual Mammoth Festival of Beers & Bluesapalooza in Mammoth Lakes, CA. This long-standing four-day festival was attended by over 6000 people and featured Grammy Award-winning performers and some of the best craft brewers in the country. 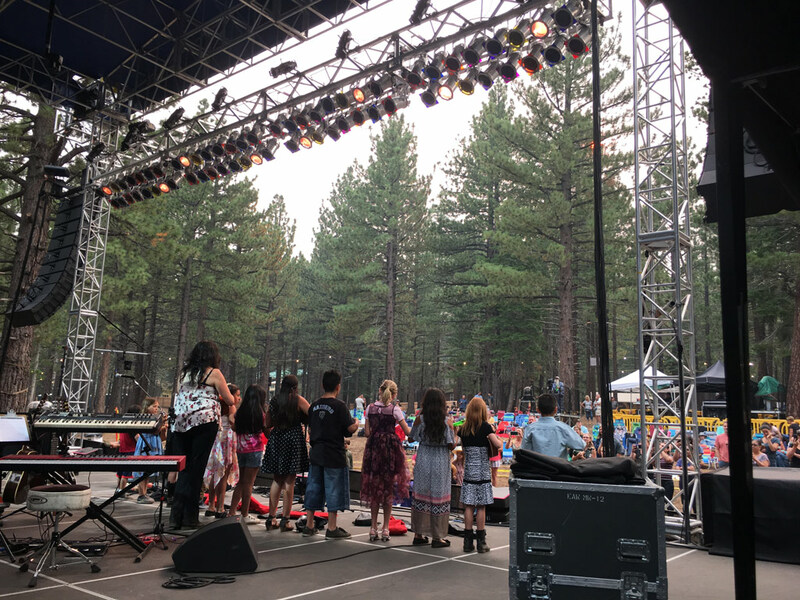 Along with that illustrious lineup of performers the Mammoth Husky Club Ukulele Kids opened this year’s festival on the big stage with a song they wrote with their instructor Leina’ala Kailiawa. The Husky Club Uke Kids are part of the ongoing MAKIN’ MUSIC AFTER SCHOOL program that Infinite Music has been funding for the past year in the local school district. The “Uke Kids” range in age from 8–11 years old, and for most this was their first introduction to learning a musical instrument. During our 5 years as a nonprofit, we have explored a variety of ways to reach kids with our musical messages and our Makin’ Music After School™ program. The program offers group music lessons targeted to elementary age students, specifically those who would not have the financial means or simple encouragement to explore music at this young age. Infinite Music’s program emphasizes an innovative learning approach for students to learn and express themselves through music in a positive, fun environment. Infinite Music supplies the teachers, weekly instruction and instruments in drumming, beginning ukulele, and rhythm and movement. Participation in the Mammoth Festival was a part of Infinite Music’s annual fundraising efforts and in addition to the Uke Kids performance at the festival, Infinite Music hosted Infinite Music Late Night providing local Mammoth musicians a performance opportunity at the festival. If you would like to help support the Makin’ Music After School program with a financial donation please visit our Donor Page. If you have used instruments that you would like to donate, those are appreciated as well!